New Delhi: Health experts across the country have decided to launch a nationwide drive to prevent the needle-stick injuries caused by unsafe disposal of insulin syringes and pen needles by diabetics. The decision was taken following recent surveys stating that most of the syringes and pen needles used for insulin and immunisation are disposed off in an unsafe manner, leading to needle-stick injuries. Approximately 65 million Indians living with diabetes consume about 160 million insulin syringes and about 50 million pen needles annually along with about 40 million syringes used for immunisation. The programme, likely to start in a week, will also sensitise diabetes care professionals to their responsibility toward the physical environment, while reinforcing the need for interdisciplinary cooperation between all stakeholders. As per the article in Indian Journal of Endocrinology and Metabolism, over 200 million insulin devices are generated in India each year and every day over 1,000 healthcare workers in hospitals are injured with a needle. This especially happens during insulin syringe/pen needle re-capping, intended for re-use. “While modern insulin technique guidelines address the need for appropriate disposal of needles and syringes, safe disposal of insulin delivery sharps is seldom practiced in clinic and home care environment,” said S.V. Madhu, head of medicine and endocrinology at GTB Hospital. The entire programme will be supported by the Forum for Injection Technique (FIT), an autonomous organisation supporting people with diabetes using injectable therapies to achieve the best possible health outcomes that can be influenced by correct injection technique. Data from the FTI states that apart from syringes, roughly 9.6 crore vials, cartridges and prefills are consumed in a 12-month period, adding to the burden of glass and plastic on the environment. “The net amount of plastic generated from insulin syringes alone, each year is 600,000 kg. This excludes the plastic generated from more than 40 million pen needles used every year in India,” said Sanjay Kalra, FIT advisory board member. “While modern insulin technique guidelines address the need for appropriate disposal of needles and syringes, safe disposal of insulin delivery sharps is seldom practiced in clinic and home care environment,” he said. 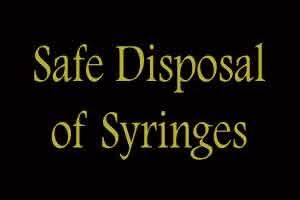 Apart from environmental contamination, unsafe disposal is having an adverse impact on healthcare workers’ safety.